If there’s one constant for the Final Fantasy series, it’s change. One moment, you’re playing a systems-focused role-playing game like Final Fantasy V, and two decades later, that’s morphed into the strange, open-world road trip of Final Fantasy XV. But this continual metamorphosis also creates a sense of nostalgia. You miss those classic games because they just don’t make them that way anymore. This is particularly true of the 16-bit era Final Fantasy games for Super Nintendo, which ushered in a new wave of Japanese role-playing fans in the 1990s. There are plenty of games that have tried to recapture that magic over the years, but few have done it as successfully as Octopath Traveler, which launches on the Nintendo Switch this Friday. 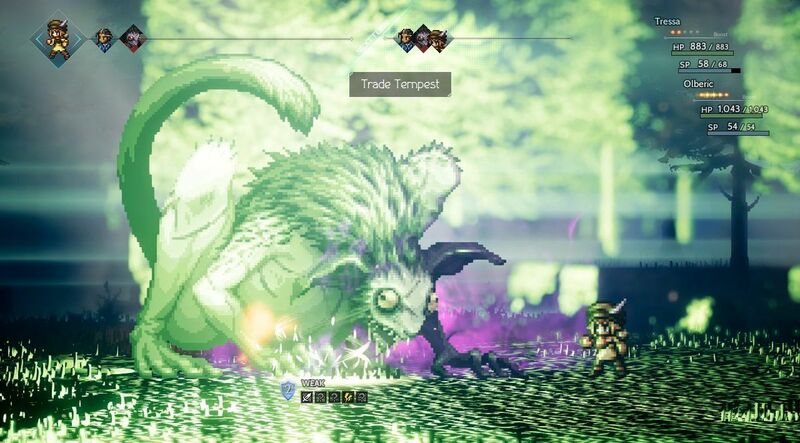 On the surface, Octopath has all of the trappings of a SNES adventure. Its cast of heroes are all cute, pixelated sprites, and they travel a map filled with dangerous caverns, snowy fields, and quaint towns. As you wander around, you’re thrust into random encounters where you fight off monsters in turn-based battles using swords and spells. For the most part, Octopath feels like a particularly polished take on the genre. The combat is familiar, yet it has a depth that makes it feel fresh even after dozens of hours. There are also a number of quality-of-life improvements — like plentiful save points and warnings about high-level enemies — that help it feel like a modern interpretation of a classic. It even looks new, thanks to a tilt-shift effect that blurs the edges of the screen, creating a pixel art world that feels like a virtual diorama. But where Octopath really differentiates itself is with its story and structure. Japanese RPGs are almost uniformly linear experiences. You venture from one town to the next, completing quests on a set path to saving the world. Maybe there’s a side-mission or two, but that path is the same. Octopath is different. It doesn’t have a single main character. Instead — and here’s where the ridiculous title comes in — there are eight adventurers, and you can move back and forth between their stories as you like. The game opens with you choosing a starting place; in my case, I began the game in a sleepy seaside village as Tressa, a merchant who wants to travel the world learning her trade. Each character has their own individual arc, which is divided into a series of chapters. You can approach these in any order or even skip some if you want. You can only have four characters in your party at any given moment, so you don’t actually need to complete every story. For me, the individual tales were all worth playing through. There’s the young dancer who has spent a decade searching for the men who killed her father and a disgraced knight who is looking for redemption after being betrayed by his best friend. My personal favorite is Ophillia, a religious devotee who sets off on an ancient pilgrimage through dangerous terrain. The stories cover very different ground, and they are tinged with a sadness that’s common in these kinds of RPGs. Everyone has secrets, and they’re usually quite dark. Each chapter follows a familiar pattern: you venture to a town, learn about something going on, and then head over to a dungeon to defeat the bad guy. Once you complete a chapter, a new one will open up elsewhere on the map. These are gated somewhat. While most initial chapters are playable early on, you won’t be able to tackle chapter two of a character’s story until they reach around level 20. This trend continues with later chapters, so you’ll either have to play through all of the characters or do some grinding to get the necessary experience to continue. As much as I enjoyed this more open structure, it did come with one significant drawback: the stories don’t intersect in any significant way. Think of it like an episode of Game of Thrones. At any given moment, there are multiple things happening simultaneously, seemingly disconnected events taking place all over the world, but you can feel the narrative threads start to converge as time goes on. That doesn’t really happen in Octopath. Instead, each storyline feels separate from the rest. While your characters travel together in the same party, they hardly interact. They might be together physically, but they’re separate narratively. There’s some optional dialogue where Cyrus the professor might ask Tressa about some new gemstones she’s found, but that’s about it. This often feels odd, especially if you play a lot of RPGs, games that are typically about a group of people banding together to accomplish a particular goal. Octopath is more like a traveling adventurer hostel. Everyone technically works as a team to battle foes and share resources, but they’re all focused on themselves. Each individual story is interesting on its own, but that larger sense of unity has been lost in the quest to make a more open-ended JRPG. In almost every regard, Octopath Traveler has exactly what I want from a classic-style role-playing experience. It offers a huge world to explore, memorable characters to discover, challenging boss battles, and a complex series of systems that let you customize your explorers. And it’s a perfect fit for the Nintendo Switch, as you can absentmindedly grind for experience on the go and then soak in the beautiful visuals and soundtrack on your couch. It’s classic Final Fantasy reimagined for 2018. I just wish it felt more cohesive. Octopath Traveler is available on July 13th on the Nintendo Switch.